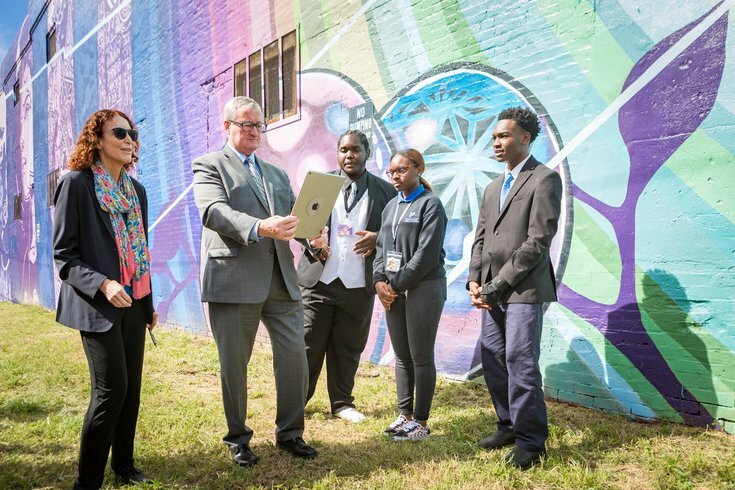 Students from Mastery Shoemaker Charter School and Haverford School, along with Mural Arts Philadelphia Executive Director Jane Golden, help Philadelphia Mayor Jim Kenney use an iPad with a free app from Blue Design to experience the sounds, voices and imagery from the community that are incorporated in the mural. Created in collaboration with students from Mural Arts Philadelphia’s Art Education program, world-known D.J. and Philly’s native son King Britt, along with artist Joshua Mays, teamed up to create a new sound and visual experience that challenges everything we may have thought we knew about public art. Called “Dreams, Diaspora and Destiny,” this futuristic multimedia experience is helping to define the future of Mural Arts in Philly. “We have integrated tech into our work in small ways before,” admitted Jane Golden during a phone call before the mural dedication. The Mural Arts executive director said up until now this was mostly limited to QR codes that worked with smartphone apps. The organization’s own Monument Lab series also provided digital accompaniment that helped to explain and enhance artists' work throughout the city, but this latest collaboration, admitted Golden, is radically different. The new project, which integrates art and technology through image recognition and the sounds of an original score, is based on collaborative community interviews and youth-created sounds. Using a free app available on smartphones, which was created by Blue Design, viewers can actually see and hear the art come to life. 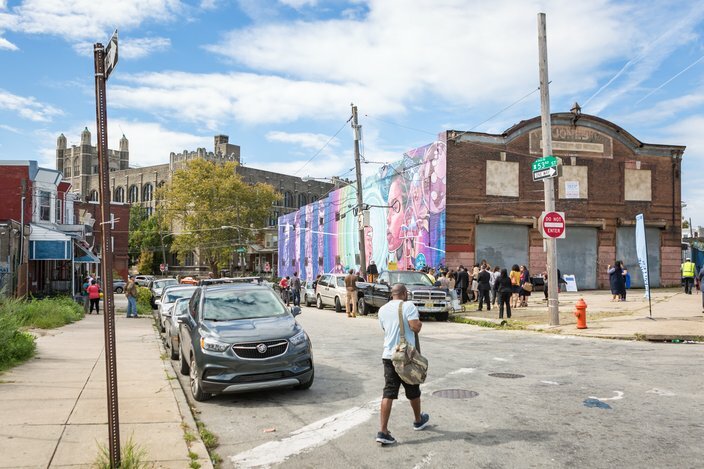 Philadelphia's first augmented reality mural, “Dreams, Diaspora, and Destiny” was installed on a building on 53rd Street in West Philadelphia. Golden said Mural Arts has long wanted to bring “tech seamlessly into art making,” and through this project it’s finally happening in a no less revolutionary way thanks to image recognition and an entirely original score that she hopes will have deep meaning for the community that inspired it in the first place. It took about a year to get this new project off the ground, onto the walls and into the ears of the location at 5300 Lansdowne Ave. in the heart of West Philadelphia’s Conestoga neighborhood. Golden’s hoping the end result, when it’s officially unveiled next month, will ultimately make us all rethink the way we look at art – both now and into the future. 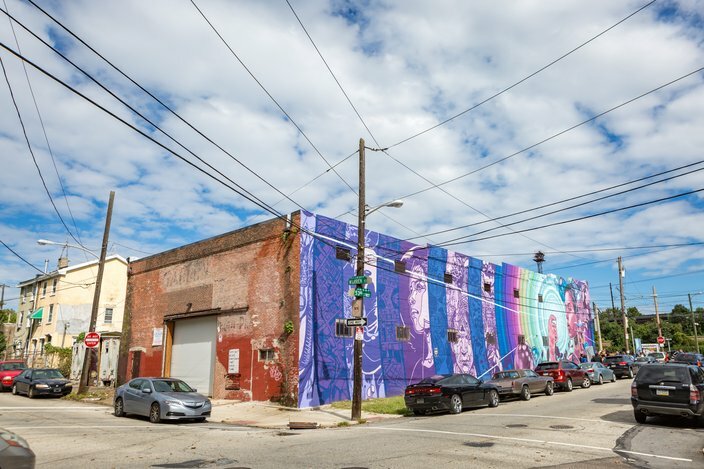 The painted mural and accompanying sound experience is inspired by historical archives, audio samples collected directly from the community and Afro-diasporic images that have come to help define Philly’s culture. The result, according to Golden and the artists, is a kind of “monumental time portal” that honors ancestral legacies while envisioning nothing short of a utopian future through a multimedia experience like no other. It features everything from image and music to poetry and history lessons. The project itself first came about more than a year ago when Britt approached Mural Arts to partner with Mays. “We’re always really open to artists' ideas,” Golden said. For quite awhile, Golden admitted that she had been in talks with Britt about a possible collaboration; he had been a guest curator at MoMA Ps1 after all, and has become involved in multimedia arts projects at institutions around the country. As a composer, Britt has even collaborated with De La Soul, Madlib and Moor Mother. Throughout his fabled career, he’s combined music, culture and performing arts in his work, curating a lot of attention-getting collaborations at Fringe Arts and beyond. As such, one of the goals of this project was to harness Britt’s rich experience to create a new art piece that taps into public education. 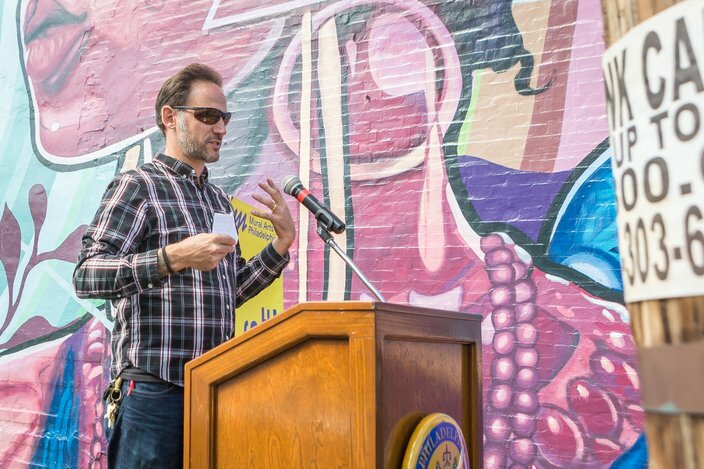 Co-Lead Artist Brad Carney spoke at the mural sneak peak event on Thursday, Sept. 27, 2018. “It was Britt’s idea to work with Joshua,” said Golden. Golden and Mural Arts was sold, knowing that the project would “open up a new world to young people,” she explained. The project got started by doing preliminary interviews with people that helped create actual sounds. Kids in classrooms at both the Haverford School and Mastery Shoemaker Charter School participated in the creation of this boundary-pushing project from the very beginning, the first partnership of its kind from Mural Arts that connects public and private high school youth in such a uniquely hands-on way. The mural, “Dreams, Diaspora, and Destiny” on a building on 53rd Street between Warren Street and Lansdowne Avenue in West Philadelphia. The excitement around the app, Golden said, “is thrilling, and the feedback from kids has been great.” She said she’s talked at length about the future of young people in our community with Britt, and how they can reach them through art and creativity. She said they wanted young people to know that they can bring a seed of an idea into fruition with hard work. Mays, who was the mastermind behind the visual components, is an Oakland-based painter, muralist and illustrator. He had lived in Philadelphia for a few years before setting off to create noteworthy mural commissions in the U.S. and far-reaching locales like Johannesburg, Mexico City and Jakarta. 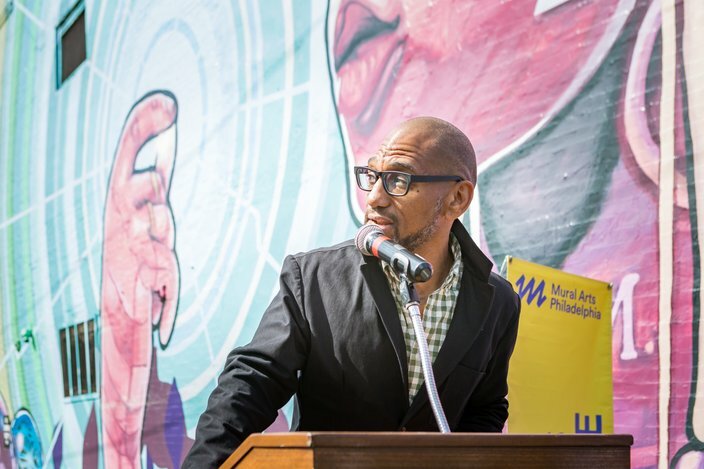 King Britt, a DJ, composer and record producer from Philadelphia is a Co-Artist for “Dreams, Diaspora, and Destiny.” Britt, who spoke at a sneak peak of the new mural on Thursday, glanced over to neighbors on 53rd Street to thank them for their involvement in the project. Two free events are planned in conjunction with “Dreams, Diaspora and Destiny,” including a muralLAB talk with King Britt, Joshua Mays, Walé Oyéjidé, and Jill Is Black on Oct. 7 (4 p.m.) at the Barnes Foundation (2025 Benjamin Franklin Pkwy). This Mural Arts speaker series will feature a discussion with these four artists working in music, painting, design and poetry. Oct. 9 (4 p.m.) is the official dedication of the mural at 5300 Lansdowne Ave. The public is invited to attend the event and download the free smartphone app for the full multimedia experience.